In the highly competitive airline industry, award-winning Qatar Airways has undergone a phenomenal expansion period, with an average of 35% growth year-on-year for the past 10 years. Along the way, the airline has garnered many awards and accolades, becoming one of only five airlines worldwide to have been awarded a five-star rating by Skytrax, an independent aviation industry monitor. Travel by air has reached the point where it is now taken for granted in most corners of the globe. With larger numbers of passengers and more choices available in the skies, airlines looking to maintain and grow their position in the marketplace must provide a high-quality service with ever-increasing efficiency. Qatar Airways flies one of the youngest fleets in the skies. The fleet expansion is ongoing with a signed deal of $1.2 billion for two Airbus A380 "super jumbos" that will be delivered in 2009. They plan to more than double their fleet size to 110 aircraft by 2015. As part of the commitment to innovation and providing passengers with the very best, the airline has built a reputation of introducing new aircraft into their fleet and offering the latest in-flight services. In September 2006 the airline became the launch customer of the Airbus A340-600 High Gross Weight aircraft. Innovative onboard features such as dedicated First and Business Class lounges for passengers travelling in the premium cabins are specially designed for you to unwind and relax. The airline also became the first international airline in the world to introduce live digital satellite TV beamed direct to every passenger on their individual seatback TV systems at 35,000 feet. The airline made history in 2003 when it became the first airline in the world to pass IATA's new, stringent IOSA safety audit, which it retained following a re-audit in 2005. Their commitment is to provide travellers with the highest quality of service in the air and on the ground. 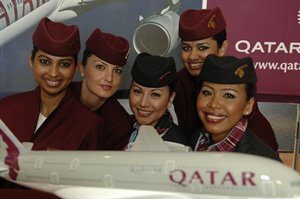 Qatar Airways plans in the future to grow these services as they continue along their path of expansion and quest to become known globally as the best airline in the world.